Ghostbusters: The Video Game, based on the smash hit motion picture franchise and featuring a completely new story, is coming to six game systems in 2009. Coinciding with the 25th anniversary celebration of the film’s original theatrical release, the game reunites original cast members to recapture the unique blend of humour and fright that established Ghostbusters as a pop culture sensation. Remember, don’t cross the streams. It could end all life as we know it! The Ghostbusters are back in an all-new story penned by the original creators! With Manhattan newly overrun by ghosts and other supernatural creatures, it’s up to you to take on the role of a new recruit joining the original film cast of the famous Ghostbusters team. Equipped with a variety of unique weapons and gadgets, you will hunt, fight and capture a wide range of uncanny phantasms and demons in an all-new funny and frightening battle to save New York City from its latest paranormal plague. Based on the classic Ghostbusters films and features the original cast Head out with unique weapons and gadgets Battle an incredible variety of supernatural foes Move through New York City and stop eerie enemies Become part of the famous paranormal ghostbusting team Included in the Slimer Edition: An exclusive Slimer bust designed and created by the original movie sculptor, Steve Johnson. Comes complete with a certificate of authenticity signed by the sculptor himself. Exclusive Ghostbusters Gamer Graffix Skins. 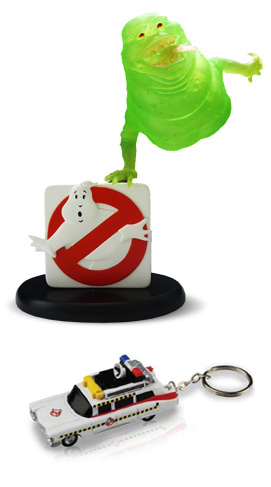 An exclusive (in the US) Ecto1 Key Chain that lights up and makes a siren sound. Ghostbusters: The Video Game features the original film cast from the classic Ghostbusters films, including Bill Murray, Dan Aykroyd, Harold Ramis and Ernie Hudson. Aykroyd and Ramis also return to write the script and storyline for the game. Enter an exciting gameplay environment that authentically recreates the whimsical time period of the film and expands the lore and supernatural events that seemingly plague New York City.